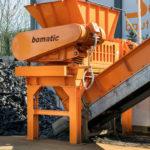 bomatic Umwelt- und Verfahrenstechnik GmbH manufactures rotary shears and granulators for professional waste crushing. 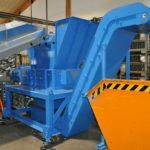 Our rotary shears, more familiarly known as shredders, are double-shaft machines which can pre-crush materials such as plastic products, tyres, metals, biowaste or food leftovers. We supply these machines in 30 different sizes with power consumptions from 2.2 to 220 kW. 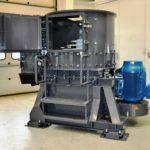 For fine crushing we can offer our single-shaft granulator which shreds the pre-crushed materials such as plastics, tyres, refrigerators or electronic waste to the required grain size. Our range of service comprises the whole production process from design and construction through in-house production to start-up and on-site service worldwide. We place special emphasis on first class customer service, quality and long life cycles of our crushing machines. As producer and service provider for the waste industry we also value our environmentally friendly production process.